Starbucks’ success lies in adapting to fit consumers needs. Ironically, as an active member of the “Gen Y” group (socially aware and technologically focused) I don’t even drink coffee. But I do drink Starbucks’ Tazo Tea, hot chocolate and Vivanno smoothies. I devour in-store apple-bran muffins, yogurt granola, ice cream and Perfect Oatmeal. My home is literred with Starbucks’ coffee mugs and coffee makers. Starbucks’ legend is revolutionizing traditional markets. Globally famous VIA transformed boring instant coffee’s quality and elevated the industry’s standards to new heights. Starbucks even dominated social media through its wildly successful “My Starbucks Idea.” Starbucks owns a music licensing company; through Starbucks’ “Hear Music”, consumers can buy limited edition CDs (my favorite was Paul McCartney). Starbucks’ beautiful partnership with HP allows me to be introduced to new genres through its Pandora-like intelligence and burn my own CDs in stores. Starbucks’ music allows me to discover new sounds from underground or emerging artists with their selection of over 20,000 albums. Are consumers bombarded with Starbucks commercials? Billboards? Never—Starbucks success is sealed around the cup: the logo is a walking advertisement. I applaud Starbucks for adapting its logo to meet consumers desires by following in famous brands footsteps and removing a barrier word in their title. Companies recognize they’ve reached global fame when their logo simply speaks for itself. Nike’s swoosh empowers energy and speed. The “Shell” inspires trust and reliability. Mercedes arouses ideas of luxury, style and sleek elegance. Refreshing taste comes to mind when viewing Pepsi’s logo. The sleek, metallic Apple captures the company’s innovative advancements in technology. Following in the footsteps of these iconic brands, is Starbucks new and improved logo. 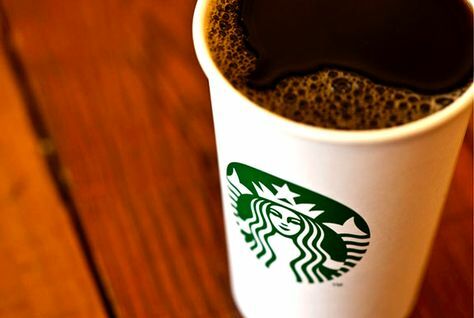 Without the limitations of the word “Coffee,” Starbucks will continue to expand into new markets (outside of traditional coffee-based products) and will empower stronger customer loyalty and brand recognition throughout the entire world. This was really enjoyable to read! 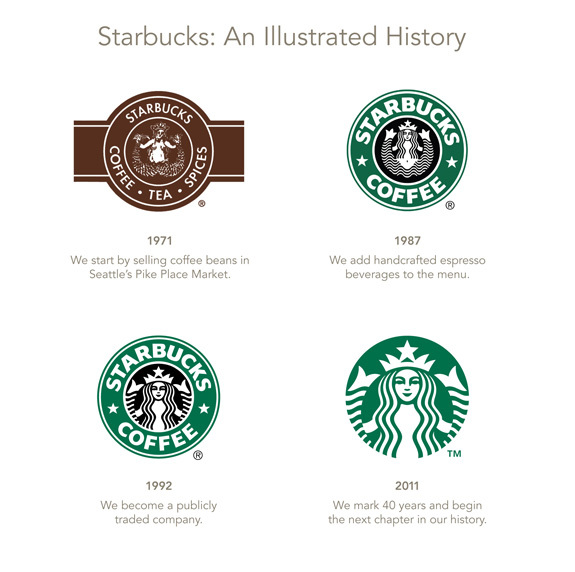 It is so interesting to see how much a logo can change and what those changes can bring about.